The "Washington Post" .. 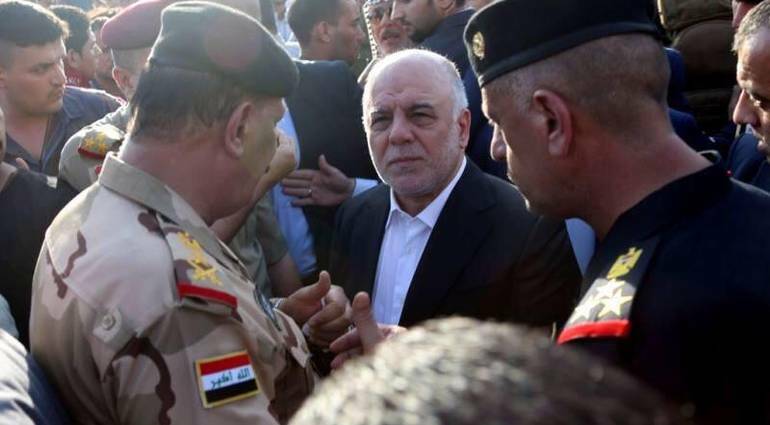 Protests ended the chances of "Abadi" with a "second term"
Thread: The "Washington Post" .. Protests ended the chances of "Abadi" with a "second term"
WASHINGTON (Reuters) - Violent protests in the oil-rich city of Basra have dealt a decisive political blow to Prime Minister Haider al-Abadi, whom the paper described as "close to America," the Washington Post reported. The newspaper said in a report, yesterday, that the angry protests in Basra to demand better services and fight corruption, ended his chances of Prime Minister Haider Abadi, winning a second term, at atime threw both his allies and opponents blamed for the unrest in the regions of the south, adding that " Abadi, during his visit to Basra yesterday, found that a calm calm has returned to the city, "noting that" the future of Abadi political special has become at the same time unknown to more and doubtful. " "Protesters in Basra have stepped up their anger at the entire ruling political class, chanting slogans from the government, parties and militias allied with Iran. This is what Abadi's rivals used for the post of prime minister, where Nauru was unable to cope with them, taking popular anger as an impossible option, . The newspaper quoted analysts as saying that "the United States, which sought to provide support for Abadi has now found itself without any influence and influence in shaping the form of the next Iraqi government," said European political analyst Kirk Suel, "The re-election of Abadi now is dead, The United States now has no good options after all its efforts to re-election because it began to drain support before the protest movement in Basra turned into widespread rioting last week. " He added that "Abbadi entered into a confused alliance with the list of Sadr leader Moqtada al-Sadr, but the deputies who stepped up the parliament through the list of slaves began to disown him in recent weeks, even Sadr himself abandoned Abadi on Saturday, following his call for an emergency parliamentary session to discuss the crisis in Basra, which During which Abadi received sharp criticism during the hearing, one of which was angrily calling from the governor of Basra, As'ad al-Eidani, a member of his party, to leave the session. " After the meeting, the religious authority issued a statement in which it pointed out that the crisis in Basra highlights the need for new solutions to the countless number of problems facing Iraq, and stressed that it will not support anyone for the post of prime minister who currently hold leadership positions. The US newspaper reported that the two strikes directed by the influential reference and political alliances are an unprecedented setback for Abadi, who was supported by the United States for a second session after he led his country to victory over a preacher to overcome the economic crisis caused by falling oil prices. The US Special Envoy to Iraq, Brett McGuck, held a series of talks with political forces in Iraq, recently to mobilize support for Abadi, in an attempt to form the largest parliamentary bloc that will be in his favor, without the results of the talks tangible results. "The parliamentary session devoted to discussing the situation in Basra last Saturday left direct effects on Abadi, where the Sadr bloc invited Abadi to resign as well as his prominent opponents, including the mass of popular leader Hadi al-Amiri and former Prime Minister Nuri al-Maliki."